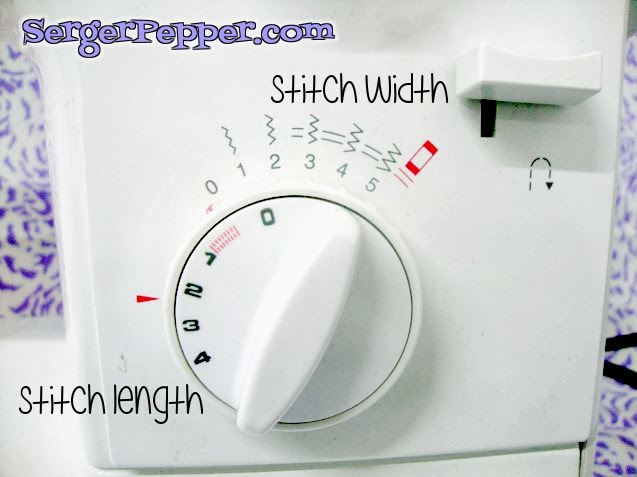 In my Sewing Machine, you can find stitch length and width on the same knob: it made sense, if you think that they’re strictly related! – Length: lowering it, your feed dogs will move less fabric above your presser foot, then you’ll end with shorter stitches and vice versa; I generally use a 2-2.5 for straight construction sewing (this is harder to unpick, much more resistant) and 4 when topstitching (aesthetically more pleasant but weaker). For a zig-zag, it’s better to keep lower numbers: for buttonholes, I stay between 0 and 0,5; for finishing seams a little more, but never more than 2. – Width: When using a simple straight stitch this is on zero; increasing this number you’ll sew a zig-zag stitch, the bigger, the wider! If you use a fancy stitch, playing with length and width settings will help you achieving a perfect result: never throw out fabric scraps, always keep some in hand to try and practice! Hint: when you try on scraps, always use the same number of fabric layers you’ll sew on your garment! If you want to keep track of your settings, mark them with a pen onto your scrap: this is useful mostly when you have to sew in sessions (naptimes?) and can’t start and finish a project all in once, or for special fabrics you rarely sew! This is one of those sewing machine parts that my mother (my first sewing teacher) didn’t use at all but I’m really loving, lately! It helps you making start and stop points stronger by locking thread on those points, allowing you to reverse your sewing direction and sewing two-three stitches backward and forward. How-to: start sewing about 1 cm inside the seam, then backstitch until the end of the fabric, then re-start sewing your seam. It’s really easy to backstitch: in my Singer you have to push down the lever, I’ve seen other models which have a button to push or a pedal function. But be careful: backstitching isn’t always desirable: sometimes you’d better sew off this point and knot the tails together (like on darts, for example) because backstitching would leave too much bulk. I wouldn’t suggest to backstitch also when basting, ruffling or when you still have to try your garment or, if you have to unpick the seam, you will be disappointed! – elastic stitches: this is a feature that you’ll end using a lot, if you’re going to sew clothing! Think about adding an elastic waistband or adding a yoga waistband, or sewing with knits or any other sewing task that involves a stitching that have to stretch when worn: if you’re in doubt, choose a triple stitch! 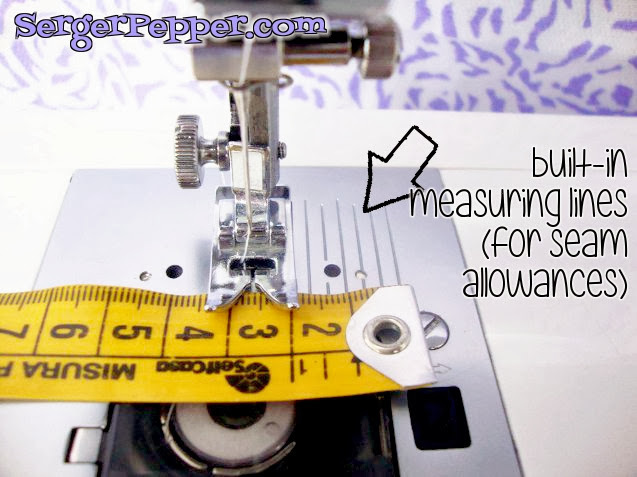 Have you ever wondered how to sew straigh and always at the same distance from the edge of your seam allowances? On your needle plate (or throat plate) you can find some grooved parallel lines: just align your edge with one of them and keep on sewing with an eye to it and your seam will be perfectly straight! Hint: can be a no-brainer help if you stick a piece of masking tape (or a rubber band) at the right distance, it’s simpler than measure every time whichfurrow is the right one! I’ve seen a lot of seamstresses that doesn’t use this time-saver feature. Can you guess why? Do you use it? If not, why? Let me know! Now that you know a little bit more your sewing machine, you’re ready to learn how to thread it… but this will be next week’s post! It’s easier than threading a Serger, but can hide some problem if you approach it in the wrong way! 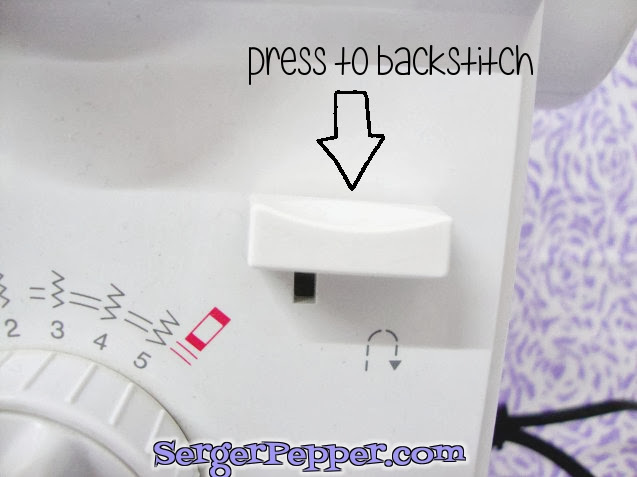 Want some more awesome content from Serger Pepper? Subscribe now to our Monday’s newsletter, you’ll receive some exclusive FREE Pattern! I’d love to hear your tip for sewing smaller pant legs! I always use my thread cutter on my regular machine. I never use it on my spare machine. (Nope, I’m not spoiled, just inherited it this past summer.) The thread cutter doesn’t work right on this machine, and just tears the thread and gives me a big fat headache! *That’s because I always forget the stupid thing doesn’t cut right when I use the machine. I’m so happy to know tht I’m not the only one using built-in thread cutter… if they works, obviously!!! A fabulous series for those who are relatively new to sewing, Irene. 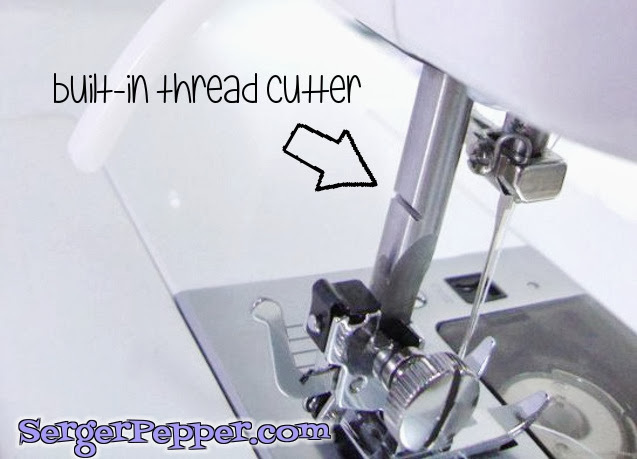 I never use my thread cutter on my machine, but always do on my overlocker… no real reason why, just habit, I guess.